Air Curtains Lower Utility Costs & Create Comfortable Work Environment | Warner Specialty Products, Inc.
It’s not MAGIC that’s making that INVISIBLE wall! An air curtain, or air door, is a device that creates an invisible wall of air across an opening to separate different environments while not obstructing the flow of foot traffic. They are the energy saving solution for when the door is open. In order for the air stream coming from the air curtain to be effective and split properly at the floor to create the seal, it needs to have the right balance of three things – volume, velocity, and uniformity. However, this combination is hardly “magical” and more the result of dedication and science. 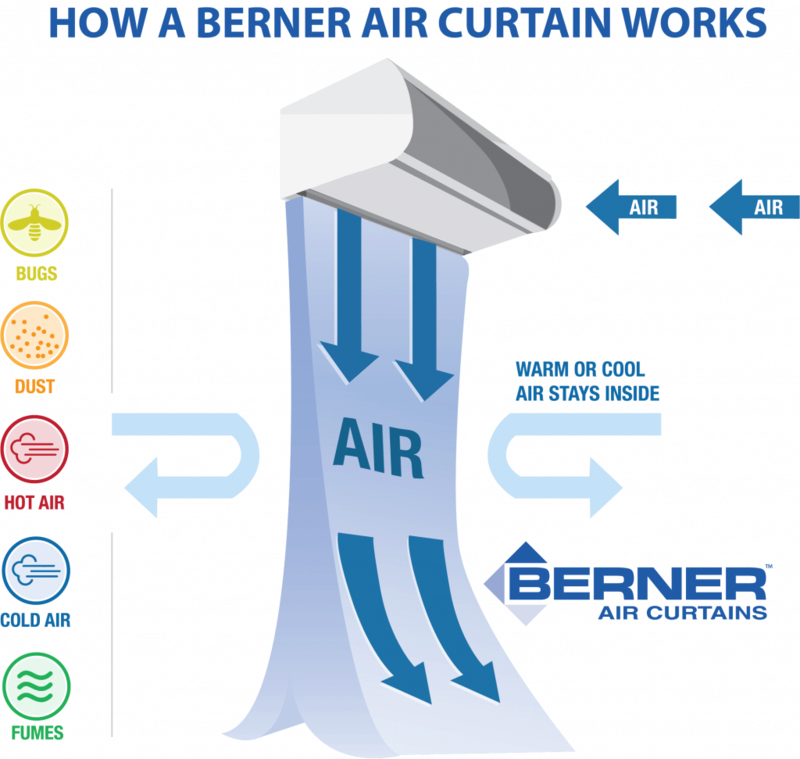 As a leader in the industry since 1956, Berner Air Curtains has conducted thorough research and product testing to find that VVU sweet spot for all of their air curtains. Shipping & Receiving – over dock doors, bay doors, and other large openings helps to maintain a more comfortable and energy efficient loading area. Service Entrance – reduce energy costs and create a more comfortable work environment when used over man doors. 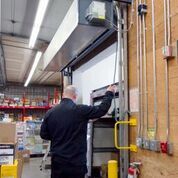 Cold Storage – use with or without a high-speed door and help maintain temperatures and prevent frost buildup as doors open and close and forklifts go back and forth throughout the day. Conveyers – plant engineers utilize for a number of purposes, including to dry parts, protect conveyer openings on the outside, and to keep heat inside oven openings. Uses for air curtains have continued to expand over the years. Beyond their industrial and material handling purposes, they can also be seen in locations such as restaurant entrances and kitchen back doors, building entrances, walk-in coolers, and, in the case of the RevolvAir™ by Berner, incorporated into revolving doors, as well. Although they create a seemingly magical outcome, nothing about an air curtain is supernatural. The awesome energy saving, comfort supplying effects that Berner air curtains provide are the results of hard earned scientific data that has been gathered and studied for over sixty years and applied to the mechanics and intended purpose of air curtains. Find out more about air curtains and an impressive demonstration click here. Posi-Flow Fabric Ducts – an alternative to expensive, bulky sheet metal ducts. Posi-Flow systems have a lower first cost and are a more aesthetically pleasing way to quietly distribute air throughout warehouses, manufacturing facilities, and other indoor spaces. Door Heaters – work by directing a high-velocity stream of hot air toward an opened doorway which warms air as it enters, protecting indoor temperatures from the outside cold.